We're Having a Banner Sale! From now until the end of April, we're selling banners for as little as $49. Whether you're planning a birthday party or a grand opening, The UPS Store of Shorewood Hills has a banner for you. We have custom templates for all sorts of special occasions, including baby showers, weddings, and more. Plus, our banners are waterproof, so you can hang them outside, rain or shine! At The UPS Store of Shorewood Hills, we care deeply about Wisconsin's educational system. That's why we're giving a special discount to all teachers and staff! If you're an employee of the Middleton Cross-Plains Area School District (MCPASD) or University of Wisconsin (UW) system, you get 20% off all printing services, plus 10% off everything else. Visit our store for more details. When you’re trying to make a lasting impression with printed materials, you want to consult with a local print expert. That’s where we come in. Stop by The UPS Store at 2858 University Ave. to talk with a real person, someone that can help you design and print that perfect flyer, brochure, menu, invitation, banner or sign. We offer a variety of printed materials and are your local resource here in Madison for all of your printing and copying needs. The UPS Store is your professional packing and shipping resource in Madison. We offer a range of domestic, international and freight shipping services as well as custom shipping boxes, moving boxes and packing supplies. The UPS Store Certified Packing Experts at 2858 University Ave. are here to help you ship with confidence. When you open a mailbox at The UPS Store, you get a lot more than just a box with a key. You'll get package acceptance from all shipping carriers, mail receipt notifications, and a real street address in 53705, not just a PO Box #. Apply today. Looking for a notary public in 53705? The UPS Store at 2858 University Ave. offers convenient notary services near you. Stop by today to get your documents notarized and check another item off your to-do list. Traveling abroad? Need to renew your passport? Stop by today to get your passport photo taken at The UPS Store location on 2858 University Ave..
Get easier checkout and flexible billing for your small business. Learn about opening a house account at The UPS Store on 2858 University Ave.. The UPS Store of Shorewood Hills is proud to be locally owned and operated. We are here to help individuals and small businesses by offering a wide range of products and services. At the UPS Store of Shorewood Hills, we care about our customers and our community. That's why we work with local organizations, such as the Middleton Outreach Ministry (MOM), the Dane County Humane Society (DCHS), and REACH-A-Child, to give back to the place we live. In 2018, we raised enough money to donate 314 children's books (pictured in the photo on the left) to REACH-A-Child as part of the Toys for Tots Literacy Program. If you'd like to make a donation, click here. We're Keith Johnston and Cheri Farha, and we're proud to serve the people of Madison, Wisconsin. We support small businesses with the products and services you need. After all we're a small, locally-owned and operated business too. We know you love being on your own, but with us, you’re not alone. We have the knowledge and expertise needed to handle all your professional printing, mailboxing, packing, international/domestic shipping, and freight needs. We help make your small business look big! Are we the 'brown truck' that delivers your packages? Nope, but we can professionally pack and ship your package, and we guarantee its safe delivery. We can also send your packages through DHL or USPS. We've got you covered. 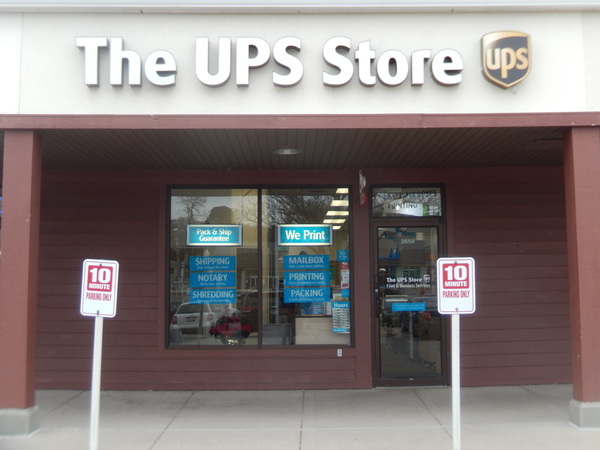 The UPS Store Shorewood Hills in Madison, WI offers the following products and services. You can also visit us in Middleton, right next to the Willy Street Co-op!